I read this book for one reason and one reason only. That reason has a shaved head and loves playing Zelda: Ocarina of Time, and I've been happily married to him for four years. 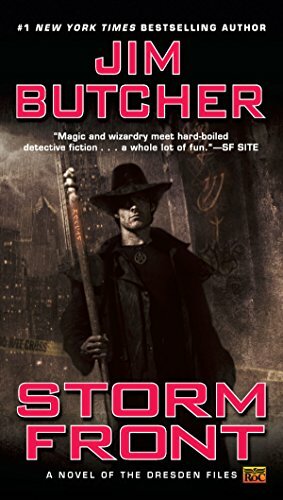 He also happens to really like Harry Dresden, a Chicago-based wizard whose magical exploits have been chronicled by fantasy author Jim Butcher in (by my count) 15 volumes in as many years. He's been after me to try out Storm Front, the first book of The Dresden Files, since approximately our second date. So, since the time I was still trying to appear dainty in his presence by ordering a salad as an entree and pretending to be full after eating it. This weekend, it finally happened. Maybe it was the weather; the extremely belated arrival of temperatures in the 60s was certainly a welcome relief. Maybe it was the knowledge that my public library would be closed today for staff training and the resulting desire to load up my bookshelf with options to get me through til Tuesday. (I know it's just one day, but anytime the library announces a closure for a holiday or some other perfectly good reason, I act like a squirrel feeling the first cold breath of winter, snatching up and storing as many books as I can in my cheeks (or tote bags)). Whatever the reason, he wore me down. I read Storm Front. And I had a pretty good time. Harry Dresden is a fun character—occasionally cranky, a little awkward with women, and sometimes averse to following the rules. He's a wizard, but not the secret sorcerer type, as he's listed right in the yellow pages. He chooses to work out in the open, although not everyone appreciates his skills. Karrin Murphy, a detective with Chicago PD, sometimes calls him in to consult on cases involving magic, to the skepticism and chagrin of her coworkers. They have a good working relationship, though tensions arise when Harry can't tell Murphy everything he knows. I could see that there's lots of room for Butcher to develop their relationship in future books. In Storm Front, Harry is on the hunt for another wizard, one who has been using black magic to literally rip the hearts from his victims' chests. Along the way he gets help from a patchwork collection of characters, including Bob the skull, Mac the taciturn bartender, sultry journalist Susan Rodriguez, and my personal favorite, a fairy named Toot. The supporting cast is varied and original, though I guess that's to be expected when you're dealing with magic. Unfortunately, someone doesn't want Harry poking around the murder scene—a message delivered more than once, with increasing violence. He can't back off, though, because the White Council suspects him of committing the murders himself. Harry has to find the real killer to clear his name, even if he dies trying. The Dresden Files may not be ultra-literary high-falutin fancy stuff, but it's not trying to be. This series would be a fun diversion if you're looking for a little escapism, and it would also be a good introduction to the urban fantasy genre if you've never tried it out. If you like Storm Front and want a similar reading experience with a female narrator, I recommended Patricia Briggs's Mercy Thompson series here.